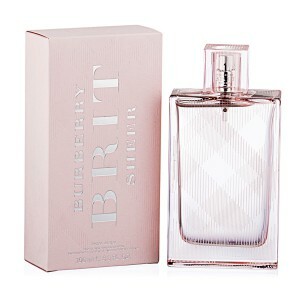 Burberry Brit Sheer is a lighter fruit and flower variation of the popular Brit flavor. Burberry Brit Sheer 100ml. Eau de toilette embodies the youthful and cheerful mood Burberry Brit, highlighting a rare charisma and personality of women who created the fragrance. Perfume is an inspired something, weightless, filled with scents of ripe citrus shades, wildflowers, spicy variations. winner divine aroma - the mistress of his life, which sets it own rules. She is passionate, extraordinary, sensual, magical. Brit Sheer emphasizes its natural beauty, giving incredible individuality and uniqueness, an extraordinary sense of style and taste. Perfume gives you the opportunity to realize the power of natural magnetism and attraction, combining the energy and youthfulness. Aroma attracts like a magnet, revealing a delicate bouquet of flowers and fruits. bottle design is in the style of perfume related to a series of Brit. In this case, the true purity stressed checkered pattern, applying a thin white lines. Thus, together combined with traditional elegance Burberry symbol of charm and femininity - Japanese flowering cherry. A refreshing, vibrant fragrance with top notes of sweet lychee, yuzu, pineapple leaves and mandarin. Heart notes of pink peony, peach blossom and nashi add a soft, floral accent, whilst a sheer veil of white musk and blond wood gently balance this fresh and youthful scent. This fragrance is a youth version of the original perfume and is designed for young people, but charismatic individualistic. Burberry Brit Sheer - a scent of freshness, youth, a sense of fun and happiness. It's filled with colorful fruit and floral notes that underscore the uniqueness, attractiveness and charm of its owner.